The official presentation and the route details for the 2017 edition of the Dakar Rally were unveiled on Wednesday at a ceremony in Paris. 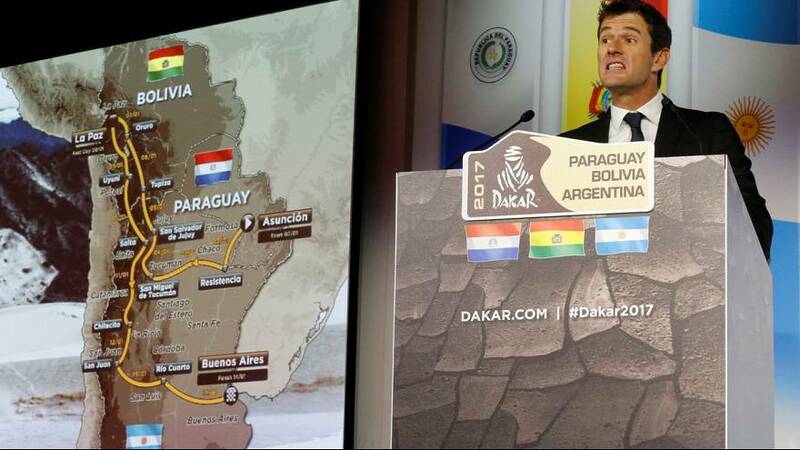 With the addition of Paraguay, the Dakar will visit the 29th country in its history and the 5th on the South American continent. As Paraguay makes it’s entry into the race programme Chile makes its exit. The countries competitors will travel through on their way to the finish line are Paraguay, Bolivia and Argentina, which has been a part of every edition in South America since 2009. Paraguay’s capital Asuncion will host the start of the Dakar while Buenos Aires marks the finish line. Race director Étienne Lavigne explained: “The keyword will be to adapt to a track, to adapt to the conditions of altitude, to adapt to climate conditions and very longs specials. There are days with stages of 800 kilometres, 500 kilometres of them in specials. So this edition is going to characterize by the long stages in complex and extreme environments”. Frenchman Stéphane Peterhansel believes his chances of a record-extending 13th title is well within reach although he admits a win could come from any of his Peugeot teammates. The 38th edition of the event and 9th in South America will take the competitors over some 9000 kilometres in total and will consist of 12 stages. The world’s most grueling rally raid runs from January 2 – 14.